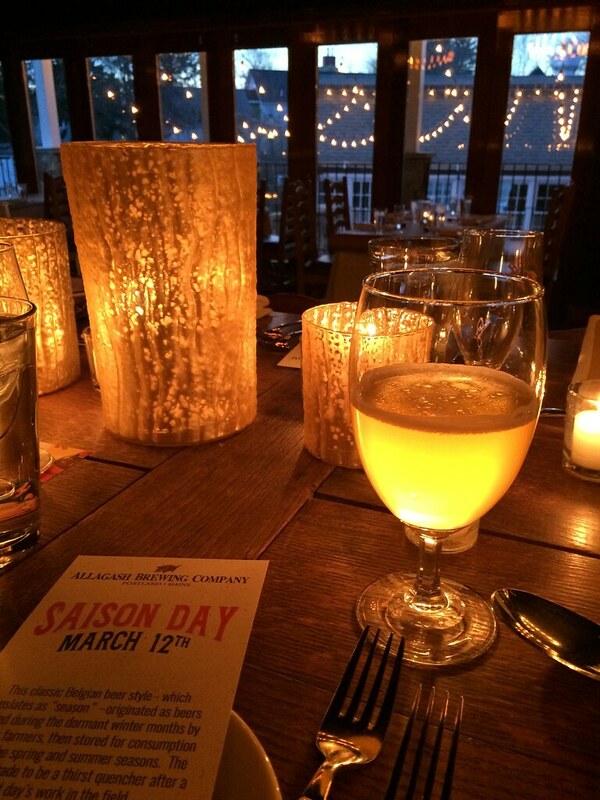 This past Saturday, March 12th was Saison Day, and unless you're a self-proclaimed beer nerd, you probably didn't notice. Truth is, Allagash Brewing Company made up this holiday three years ago to help promote its 2nd most popular style of beer (Allagash White being the best seller). This year, there were events all around Maine to celebrate: tastings, special releases, and beer dinners. I attended the Saison Day tasting dinner at Table in Kennebunk at their new facility in the former home of Abbondante on Western Ave. (which sits just behind Pedro's). The food was prepared by the chef of Ocean at the Cape Arundel Inn and paired with several different saisons from Allagash. Truthfully, when I accepted the invite, I did so a little warily, not being a big fan of either saisons or French-Canadian cooking. 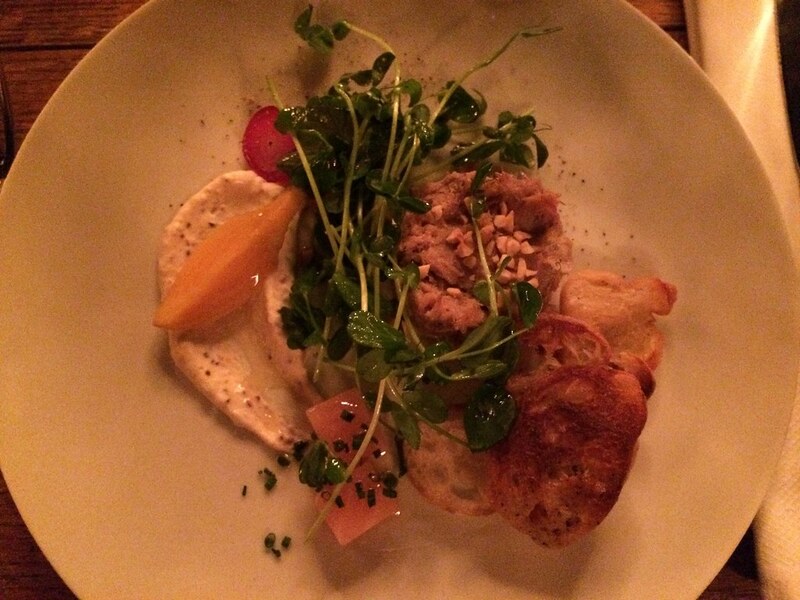 The sample menu referenced pork rillettes and cassoulet, so I was expecting a meal of heavy, rich foods. Fortunately, I was pleasantly surprised by the menu and how much I enjoyed the different varieties of saisons. We arrived a little before 6PM, which this time of year still left a little lingering light for us to check out the beautiful exterior of the restaurant as we approached. I never ate at Abbondante before it closed, but I was delighted by the the rustic building and its ample outdoor seating and firepits. Inside, it's just as pretty, with a soaring ceiling, a huge stone fireplace, and hanging wagon wheel light fixtures adorned with Edison bulbs. The large communal table in the center of the room was set with plenty of candles and glasses, lending the room a very festive feel. We were greeted by Amy of Table and introduced to several Allagash staff members who were on hand to answer questions and chat. A server brought us a glass of the Allagash Saison to kick things off and after a while, we listened to a brief introduction to the beer by Josh Wolf, the sales manager for the area. Josh explained what a saison is... kinda -- he said it's more a tradition than a style. The style came from Belgium, where farms would brew beer in the winter when it was cooler and serve it to their farmworkers in the summer (saison means "season" in French). The resurgence of the style in the US has brought us beers that are lower in alcohol content, paler in color, and have fruity, spicy, and malty flavors with a dry finish. 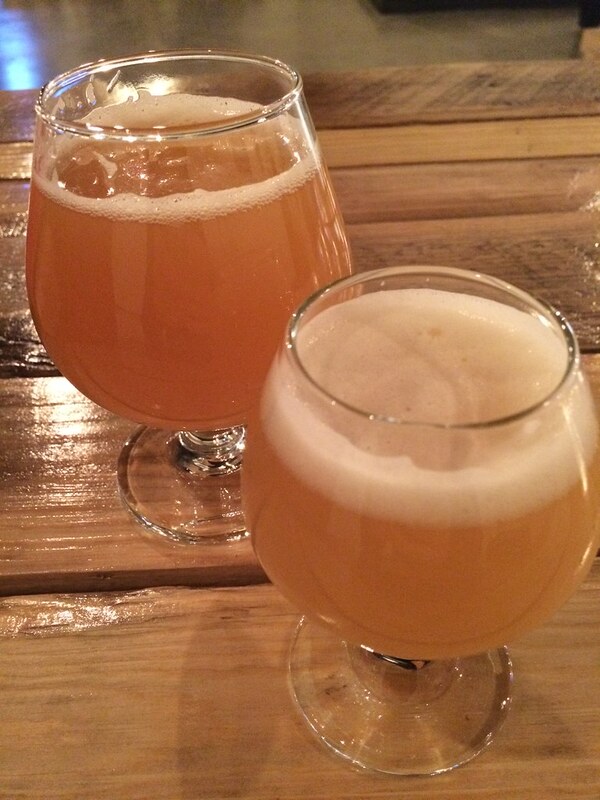 That said, Allagash then does all kinds of fun stuff with their saisons that throw a lot of that out the window. So there's usually something for every type of beer preference. The Saison went well with our first course of those pork rillettes (also made with Allagash Saison), but the Saison is pretty easy drinking, so it pairs well with most things. The porky spread was nice with the accompanying creamy mustard sauce and the tart pickled vegetables. Next, servers delivered wine glasses of the Allagash Century. This one is fermented with Saison and Brettanomyces yeast for a year in stainless steel, so it has a bit of the tart flavor that the Brett brings. 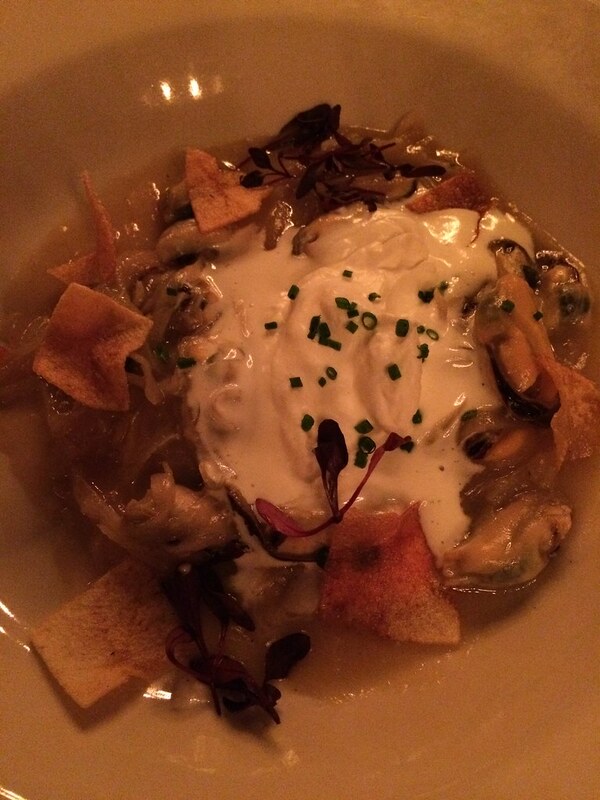 That tartness cut through the rich, sweetness of the next dish: mussels ragout with caramelized onions and creme fraiche. I was skeptical of this one before I had it, not being able to envision what mussels ragout was exactly. But the mussels were tender and plump in their broth of sweet onion goop and the potato chips on top delivered a nice crunch. 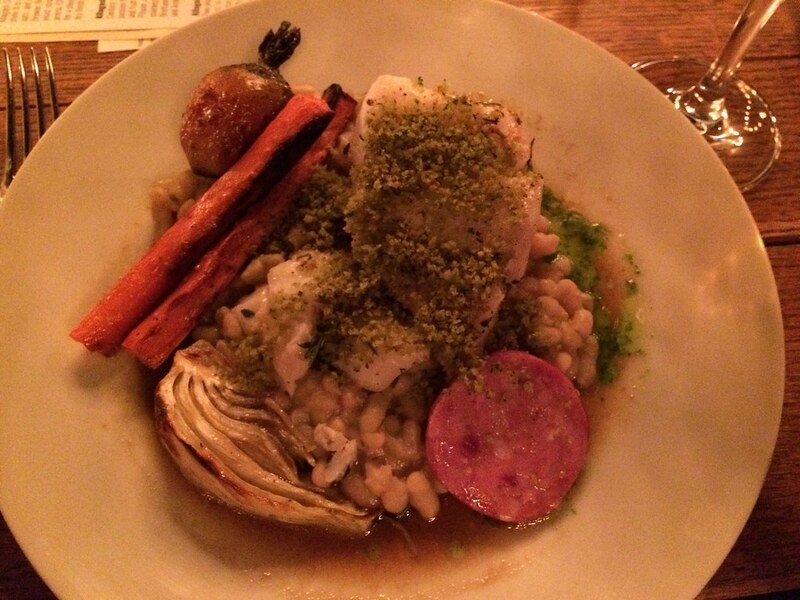 The main course, a huge piece of roast cod over sausage cassoulet with root vegetables, was paired with Allagash Interlude. Again, this beer is made with Saison and Brett yeast, but some of it is aged in former red wine barrels, which of course imparts a wine flavor. If you have a wine drinker you're trying to turn on to beer, this one would be a good place to start. Over this course Josh from Allagash shared with me the phrase "screwed by the 'lude," as in, "my night was going fine until I was..." Apparently Interlude has been the cause of several of the brewery's employees' crazy nights and wicked hangovers. I laughed, but began drinking my water in earnest. Our entree portion was huge, so I didn't make much of a dent, but despite the appearance of that "dreaded" cassoulet, this dish was very light and spring-like. The roasted fennel in particular was lovely. I must revise my opinion about French-Canadian fare prepared by the right hands. For dessert, we enjoyed the Allagash Astrid, a nice sour also brewed with Saison and Brett yeast and fermented in stainless for a year. It then ages further in used Aquavit barrels, which is a lovely idea, but I didn't pick up any of the characteristic caraway or anise flavors from the spirit. The herbs I did detect came from the dessert, an apple croustade with a rosemary crumble, a scoop of vanilla ice cream, and some blood orange caramel. We finished chatting with our tablemates, thanked our hosts, and went to take a post-dinner stroll around Kennebunkport before getting in the car to Portland. The tide was out in the river and the three dories have yet to make their seasonal appearance in the river. The streets were quiet and many of the boats still sported their winter covers. We were full, slightly buzzed, and had the streets to ourselves, so we wandered around and remembered all the fun we've had on our past KPT adventures. Even though it was only a night out, it felt like we'd captured some of that summer vacation vibe. Visit Table's calendar of events for upcoming cooking classes, dinners, and events. Preheat your oven to 325°F or a household slow cooker to low temp. Season the meat evenly with salt and pepper and transfer to a heavy pot or the slow cooker. Add onions, garlic and spices and stir to blend. Add wine, Saison Ale and brandy. Bring to a simmer, cover with a lid and braise in the oven 4 hours. If using a slow cooker, cover with lid and cook on low heat for 8-10 hours. After cooking, remove from oven or turn off the slow cooker. The meat should be very tender. Drain the braised pork mixture in a large sieve over a bowl, careful to remove all herbs and the bay leaves. Reserving the cooking liquid. Transfer the pork into a bowl. Shred the meat into very small pieces with a fork. Add the braising liquid cup-by-cup and beat with a wooden spoon (or a hand mixer). Mix until the mixture looks spreadable. Transfer into ramekins and chill for at least 2 hours before serving. Serve with toasted baguette, mustard, and your favorite pickled vegetables. 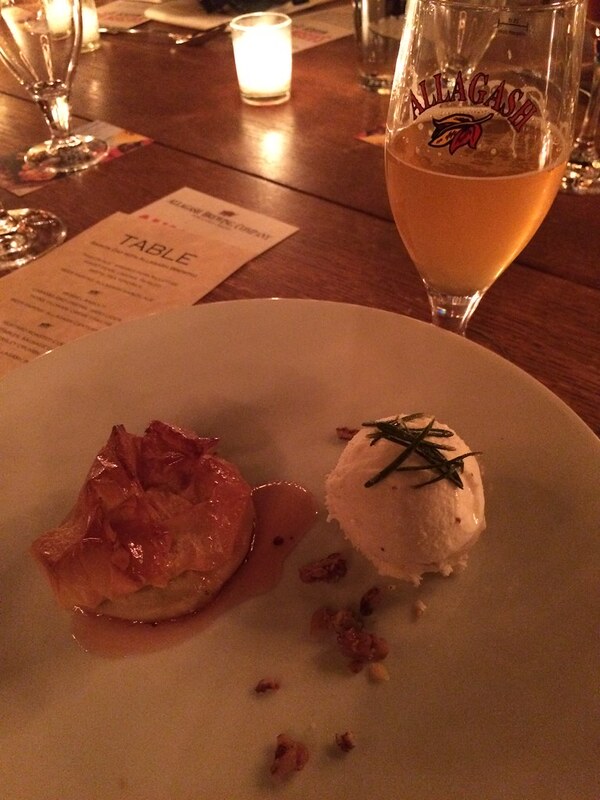 I attended the Allagash Saison Tasting Dinner free of charge and I have previously worked with Table for promotional events, but the opinions and words in this post are my own. 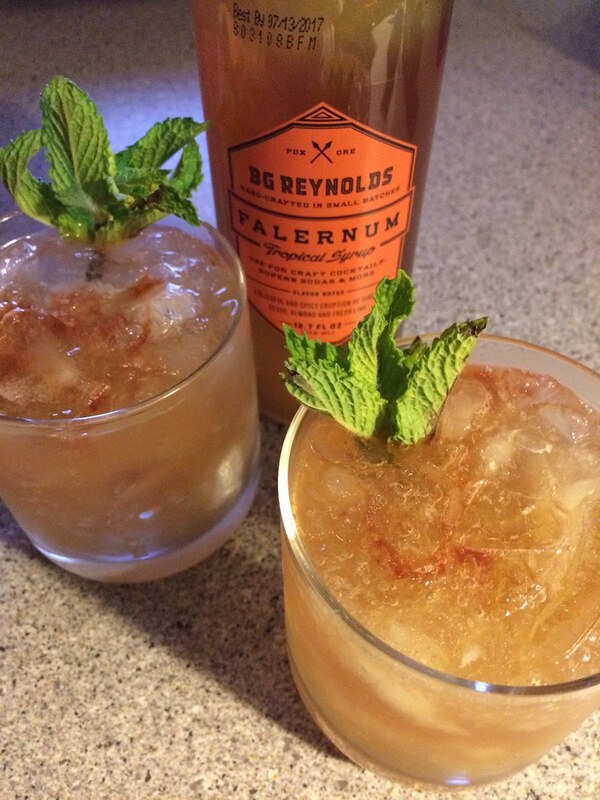 Falernum is a simple syrup flavored with almonds, citrus, and spices like ginger, clove, and allspice (you can make your own) and is used in drinks like the zombie and the aforementioned rum swizzle. Now, we're quite happy with our Trader Vic's mai tai, but Don's version appealed to me with the warm spicy notes of the falernum and the tart grapefruit juice. I think next time I'll up the falernum, as the drink was pretty tart and not much of the syrupy sweetness came through. Shake well with crushed ice. Pour unstrained into a rocks glass. Garnish with mint sprigs. Since I received a record player for Christmas, I've been really into daytrips out of Portland to hunt for records (combined with some good food, natch). So far we've been up to Vinylhaven Records and Vinyl Junky in Brunswick and down to Music Plus in Biddeford -- unfortunately, he was closed that day, but that didn't stop us from filling up at the nearby Palace Diner and having a drink at Round Turn Distilling. 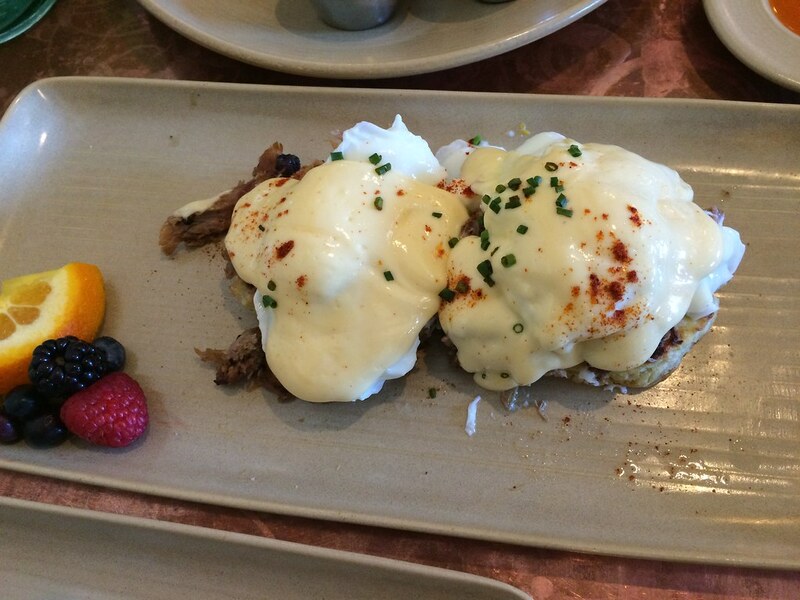 We'll just have to come back when neighboring Custom Deluxe is open for dinner. My most recent trip out of town to Westbrook though, had nothing to do with record hunting (although maybe I missed a good music shop out there?? ), but rather beer and chocolate. A nice consolation prize. The brewery itself is in a huge warehouse - one of the owners told me they were lucky to find a space that would allow them to scale up as they grow. When you enter, you walk past the brewing space into the tasting room, where there's plenty of room and tables made from recycled pallets. Between the two of us, A. and I ordered the pale ale and the IPA. I got a small glass of the IPA, thinking I'd go back for a small pale ale, but ended up sticking with the IPA on my second round. The pale ale was sweeter, with a candy flavor from the hops, and the IPA had a nice bitterness. 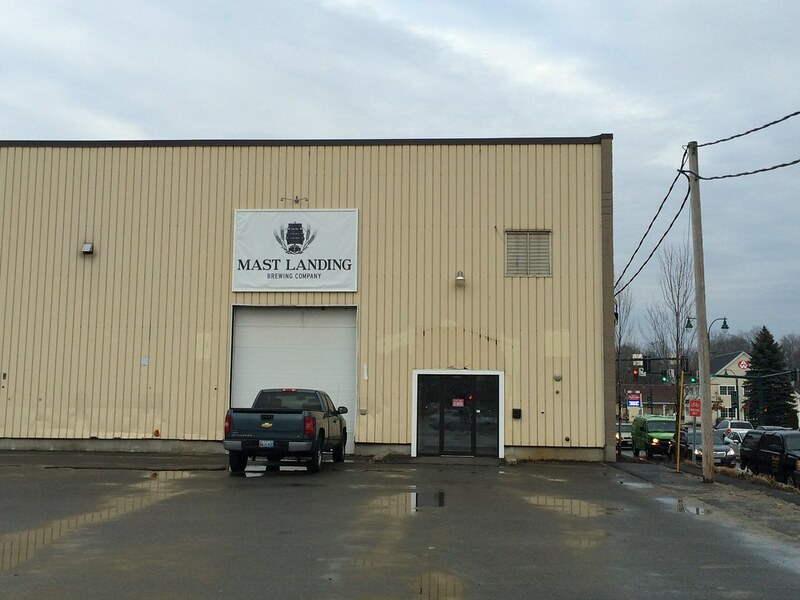 Mast Landing is open Friday from 3-8pm and Saturday from 12-8pm. The location can be kind of hard to find - it's behind Profenno's Bar & Grill, so turn into their parking lot and drive through the back of it. Once you come around the building, you'll see a big warehouse with the brewery's sign. Nearly across the street is the new home of Black Dinah Chocolatiers, with a small retail shop for their beautiful chocolates in front of a large facility for making, packing, and shipping their chocolate. I stopped in for a tour and a taste from chocolate makers Kate Shaffer and Caitlin Powell. They're providing the chocolate for the Portland Spirits Society's whiskey and chocolate pairing next week. 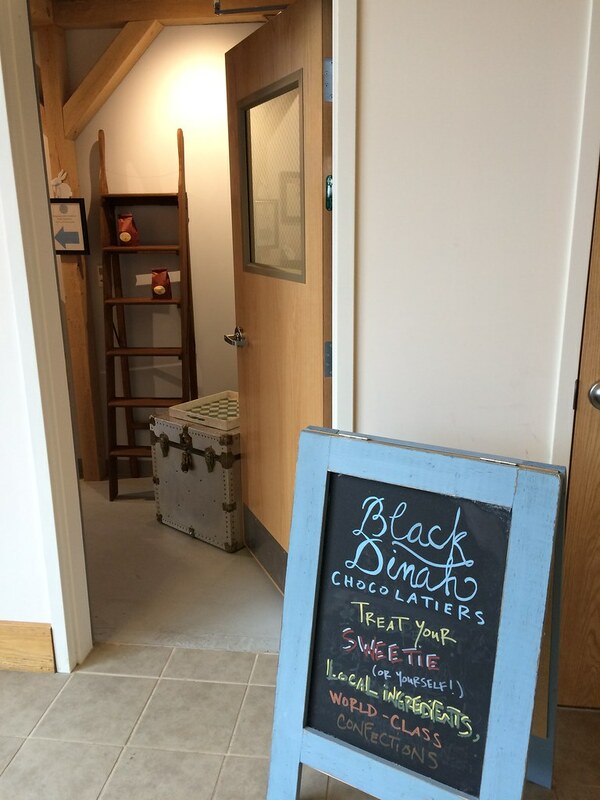 Black Dinah is new to Southern Maine, but they've been making chocolate for seven years on Isle au Haut. 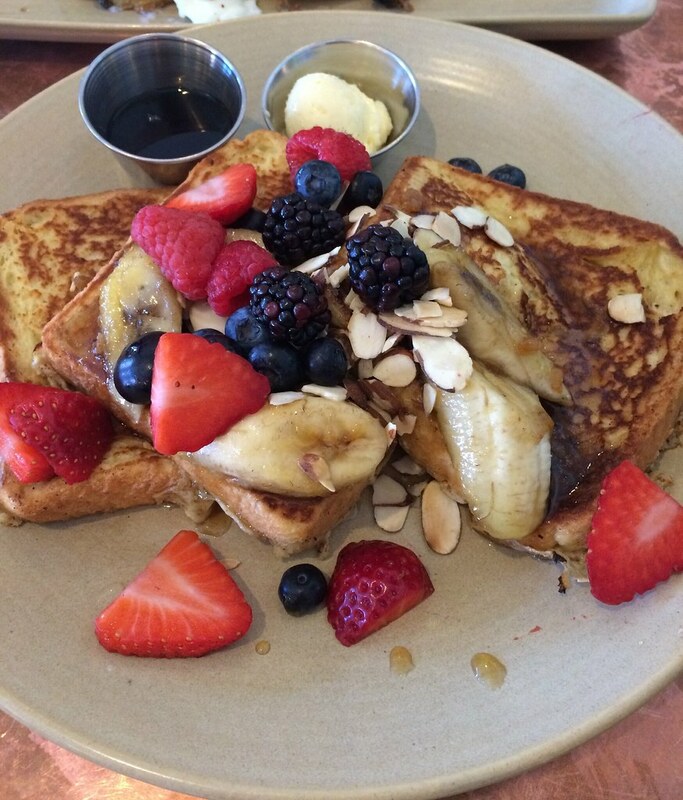 They use all fresh ingredients in their flavorings and as many local ingredients as they can source (aside from the chocolate and the sugar, of course). Many of their truffles are decorated with sweet, brightly colored patterns that are so satisfying to bite through. I tried a maple caramel covered in dark chocolate and topped with smoked sea salt and a Peruvian dark chocolate vanilla truffle that were both amazing. I won't spoil the pairings for the event by saying too much more about what I tried, but if you haven't had Black Dinah's chocolate, do yourself the favor of seeking some out. The retail shop is open in Westbrook Monday through Saturday, 9am to 5pm. 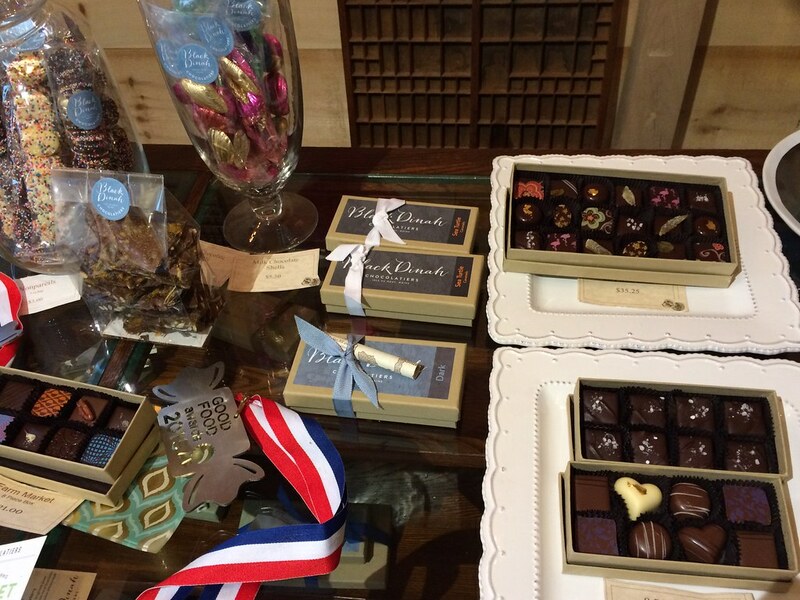 Their chocolate is also sold at LeRoux Kitchen, Browne Trading, and Lisa Marie's Made in Maine (on Exchange St.). As Portland fills up and space continues to become more expensive, don't be surprised to see more and more business opening that make the trip to Westbrook worthwhile.